At the invitation of Father Stefan, Chargé d’Affaires a.i. 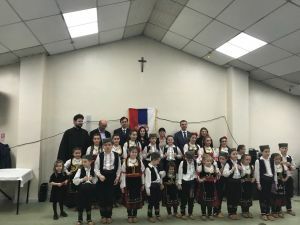 Nataša Marić paid a visit to the Leicester-Derby Parish, on Sunday, 4 February 2018. The feast of St. Sava was celebrated at the parish level in Leicester. The Holy Liturgy officiated by Father Stefan and the blessing of the Slavic cake were followed by a cultural and artistic programme including the performance of Folklore Ensemble St. Eliah Corby. The celebration was organized by the church committee headed by President Mrs. Ljiljana Drobac.